Could this mean the end of Cruella with the added humiliation of being replaced by a ventriloquist's dummy? More like Walter Softey to Boris's Bully Beef. what not anther wally no nothing. The bookies have it at 5/1 on a Tory leadership this year but I'm not so sure as a contest would take 3 months and the finish would clash with us having negotiated a leaving deal with the EU. One thing the PM is good at is saving her own neck and she would have taken it into consideration last Friday. 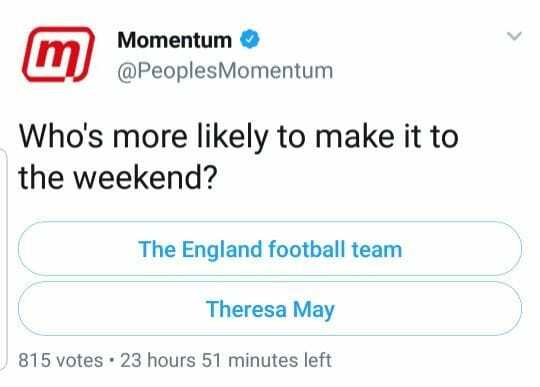 How about giving the PM a red card and award the job on penalties; or maybe just give the job to Gareth Southgate and his team. Mind you with her catastrophic record she could have also be planning to foul up the England teams chances of winning the World cup. PM told her warring top team at Chequers it was time to 'come together' if they were to win like the Three Lions"
Delusional woman who obviously believes her own publicity. rats , sinking ships and all that. bring a election on. Look on the bright side; I bet the Afghans are relieved. Seeing as this thread is about the “ Next leader of the Conservative party “ I would suggest that the question is virtually immaterial. Given that May is more or less the female equivalent of Major ( God help us! ) anybody else would find it difficult to do a worse job. I would suggest that the No. 10 cat could take over, but not sure if it’s still alive? Even so, a dead cat would still be preferable to the lump of dead wood that we currently have as a PM. agreed john, evan dead wood could do better. Sounds like a musical comedy is in the making then Brian? We all remember the PM campaigning at the last General Election on the ticket of "I am not Corbyn", tonight she addresses the 1922 committee with the line "If you don't back me you get Corbyn", clearly some lessons are never heeded. Liam Fox is the favourite to resign next at 2/1 on. Things can change very quickly, soon after resigning Boris Johnson was installed at 2/1 to be the next leader. By the end of the day JRM was 4/1, Sajid Javid 11/2, Gove and Johnson at 6/1. The general consensus is that the PM is safe for now. Not many days until Parliament packs up for the summer and the PM will celebrate her survival with a litre of Pimms. We can be sure that plots will steadily unfold with MPs wanting to be on the side of the winner in order to further their careers and the more I think about it the more I see Sajid Javid entering the winner's enclosure. The PM is really in trouble here so I have given some thought to how she can recover. What I suggest is she goes on a walking holiday with her husband and upon return calls a snap General Election in order to boost her majority and give us strong and stable Government. What could possibly go wrong? rock climeing would be a good summer holiday for her and her old man.